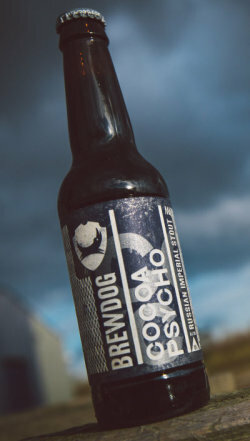 I recently invested in BrewDog via their currently running Equity for Punks scheme, so it's no coincidence that BrewCamp beer for June is Cocoa Psycho by BrewDog. This is an intensely flavoured Russian Imperial Stout that bears a passing resemblance in flavour and texture to a barrel stout I was involved in a few years ago, albeit with a massive difference in FG: 1.021 vs 1.007. I'm still not sure why that barrel stout finished so low, other than that there is some organism in the barrel that's not supposed to be there. I would describe most of Cocoa Psycho's character as coming from the roast grains, possibly with some astringency from coffee, though the coffee is very hard to pick out. Oak chips and vanilla pods are in the description, but again I don't pick up any oak or vanilla flavours, another similarity with this and the barrel stout of a few years ago. They are possibly there but just masked by the roasted grain. It is a very thick and almost syrupy beer; obviously a lot went into it, reflected in its off-licence price tag of €7 for a 33cl bottle. I don't think there is any Cascade character present so I plan on bittering with hop extract or Magnum. Yeast is not specified but I think a neutral yeast like US-05 or WLP-001 would be appropriate, however US-05 does not attenuate enough to make the final numbers work. Chris White was right when he said liquid and dried yeasts are not the same! Phil said he can pick out the crystal malt clearly, but again I'm not so sure: if I hadn't been told it was there I probably wouldn't notice. Unfortunately I'm all out of black malt but Mark said he'll sort me out with some, so this should make for an interesting brew, but we've all agreed it will take time to mature, so I won't have an update on this one for 2 months or more. how did this turn out? I'm blown away by how much dark malt you're using. For the ABV, the BUs don't look especially high, but I guess the roasted malts/barley will contribute their own brand of bitterness. Haven't brewed it yet Andrew. Young lad got a broken eye socket so I've been in hospital the last while with him. Will brew it tomorrow hopefully, but it'll take a fair bit of aging.